Technology designed to monitor environmental pollution has been adopted by scientists to detect disease. The project, by researchers at the University of Leicester, is known as the Diagnostics Development Unit and has been likened to a 'Star Trek' style sick-bay. 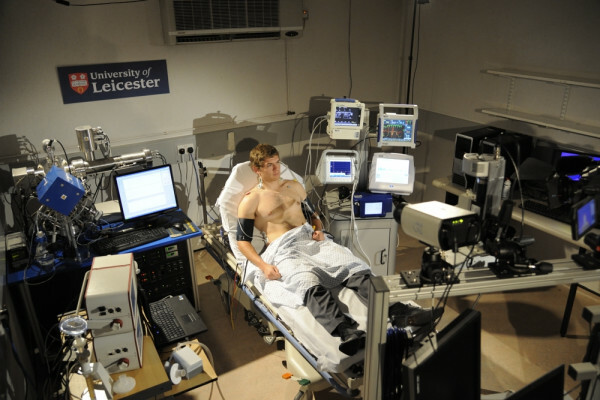 At the moment, the equipment is under test at the Leicester Royal Infirmary. Paul - We've taken instrumentation that we use in the laboratory and outside in the environment for actually smelling the air, sniffing the chemicals in the air and we're now using it in the hospital environment to smell peoples breath. Richard - So what is the set up here? It looks like there is computer monitors there - a camera stand, a tripod there. Now, this I recognise. This a mass spectrometer so you can analyse individual chemicals, a series of long metal tubes with complicated piping and the like. Paul - Yes, what you've got in front of you is what we call a proton transfer reaction timer flight mass spectrometer but it's a way actually of measuring and weighing molecules very, very quickly. So we can take the molecules coming out of your breath and weigh them and actually look at the composition in terms of the chemical composition of your breath and what we hope to be able to do with that is actually smell disease. Richard - Now, Tim, we're in a room full of this equipment, but on the other side of this are the bays where there are patients coming in as we speak being attended to in the emergency department. Tim Coates - That's correct and we've got a series of ports through the wall there both electronic and physical so that the patient the other side of the wall can be monitored using the equipment in this room. Now that means that the doctors and nurses in the emergency department can continue treating the patient while the monitoring is going on. So even the sickest patients can be in there and we can be monitoring them. That's something in the past that's been really difficult to do. For example, a patient with a chest infection coming in - we know that different bacteria produce different molecules, we can sniff those molecules using the mass spec and perhaps tell which bacteria is in a patient's chest. Now that might help us give them the right antibiotic for their infection. We don't know that we can do that but that's the sort of potential we're looking at. Richard - What do patients do? What do you attach to them? Tim Coates - So they have a mouthpiece that they breathe in and out to get the breath sample. They also have a series of stickers that we put on the body - we have a series of cardiovascular monitors. So we're really looking at their heart with the cardiovascular monitors, their lungs with the breath analysis and then we're also doing some imaging - you mentioned the camera and tripod - that's a high perceptual imager which has been translated across from space science. We're doing a battery of different tests on our patients. Richard - What we really needed was a volunteer, so I agreed to try it out. The test involved breathing into a mouthpiece in time to a regular beep. Paul - What you can see on the screen now, as you are doing this, is actually the CO2 which is what we use as a marker in order to do that and then on the top is the volume of air that you are putting out into our instrument. And we can see on the mass spectrometer screen behind us the chemical data coming up from the measurements that we're making. Richard - I must say I was pretty rubbish at breathing in time with the beep - that was quite difficult. Paul - Actually, your breathing was quite regular but your volume was a bit all over the place. Richard - Oh okay, yes. So now we move over to the mass spectrometer which is this shiny collection of tubes and here's the screen with my breath analysed. Paul - Yes. We're actually looking at the chemicals in your breath and we've looked at it in real time and what we've got up on the screen here are peaks like acetone, which is a diabetic marker, also ethanol just to check that you haven't had a drink this afternoon before you came to join us. Richard - So is it okay? Paul - Yes, you will live. Richard - And for a hospital environment this is a fairly fearsome bit of equipment. I imagine it is also very expensive. You really need to miniaturise this don't you? Paul - The idea, at the end of the day, is actually to miniaturise these things and maybe even produce handheld diagnostics, something like the size of a glasses case that you would be able to breathe into. Maybe even one day your mobile phone.